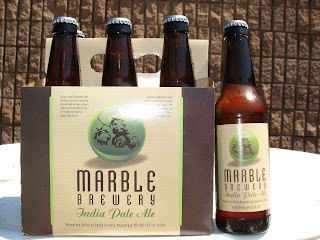 Looky what we have here...Albuquerque's very own Marble Brewery has started bottling their delicious IPA and I was able to get my hands on some! The label gives us the info that Columbus, Amarillo and Centennial hops are used in this beer. No complaints there. I remember when Ted Rice made a great single hop IPA with Columbus hops back when he was at Chama River, and am glad to see he hasn't forgotten about them. The Centennial hops are immediately present in the nose, which is one of my favorite traits in an IPA. Let's hope Marble can get some heavy-hitting distribution for this beer so the rest of the country gets to see that New Mexico can produce a great bottled beer.